Like much of France’s Southwest, Bergerac shares a storied and seemingly uneven rivalry with Bordeaux. But with their vineyards touching, Bordeaux’s shadow may seem inescapable to Bergerac. Both regions grow the same grapes on the shores of Dordogne River, with Bergerac’s climate only a shade hotter than that of its eastern neighbor. 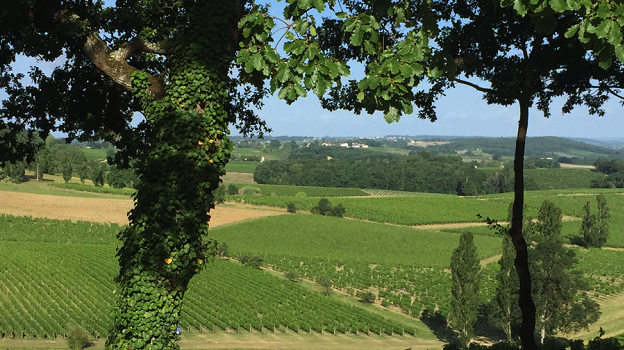 While Bergerac seeks its own voice in the world of fine wine, its vintners will be the first to point out the fabled vines of Saint-Émilion looming in the distance. Admittedly, in writing this article, I too found it challenging to discuss these wines without conjuring their Bordelais analogues. As as much as any competition with Bordeaux may appear an uphill battle, this was not always the case for Bergerac. For centuries the “black wines” of the Southwest were lauded for their deep concentration and superior quality. The Dutch would not drain the Médoc of its marshland state until the 17th Century and make what would become many of Bordeaux’s most prized vineyards plantable. Yet Bordeaux long maintained control of a potentially greater asset: its port. Since the 13th Century, Bordeaux heavily taxed its Southwestern competitors, suppressing their booming export business. The Southwestern landscape suffered as a major battleground during the Hundred Years’ War, and the Black Death that coincided with and succeeded it plagued its residents. Reduced to poverty, the region was riddled with peasant revolts and recurring pirate raids. To make matters worse, Bergerac also served as a Huguenot stronghold. Upon the evocation of the Edict of Nantes in 1685 (which provided legal protection to Protestants), locals faced significant persecution that further hindered their wine industry. Fast forward to the mid 1800s, phylloxera devastated Bergerac’s vines. Today, Bergerac cultivates approximately one sixth of the vineyard area it held before the phylloxera crisis. While history has not been nearly as kind to Bergerac as it has been to Bordeaux, the result has led the region’s wineries to embrace a wholly different philosophy. Bordeaux’s great châteaux focus their attention on one or two wines. Bergerac estates are far more diversified, often building their portfolios to over a dozen bottlings. 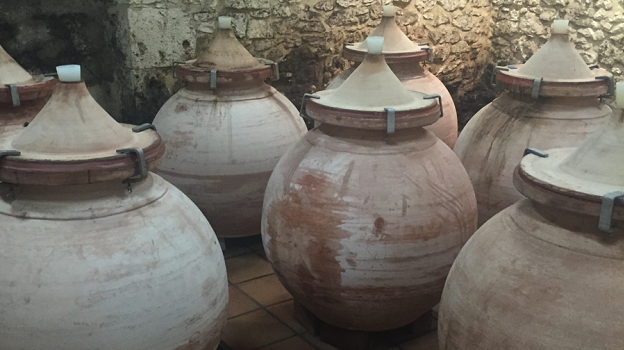 Many Bergerac winemakers will experiment with any trick imaginable, from amphorae ageing to introducing grapes foreign to the Aquitaine (could you imagine finding chardonnay next door?). Without the big Bordeaux brand breathing down its neck, Bergerac possesses the freedom of exploration. This is a refreshing change of pace from many of France’s most classic regions, where tradition sometimes comes at the price of innovation. An air of humility also pervades the entire region. For many of the estates, the proprietor and winemaker are one in the same. Even among the wineries housed in the most lavish castles, few possess the same technological resources as the famous Bordeaux properties. The vintners are more collaborative than competitive, demonstrating tremendous pride in not only their own products, but in the region’s accomplishments as a whole. Unlike Bordeaux, Bergerac isn’t just synonymous with wine. The Dordogne is a culinary Mecca and one of France’s most respected suppliers of foie gras, along with black truffles and walnuts. 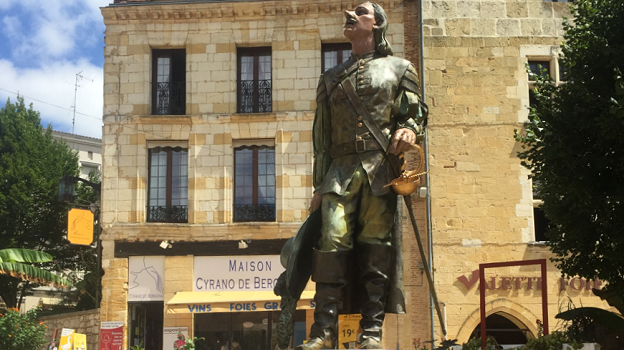 I’d also be remiss not to mention Bergerac’s most famous fictional resident, Cyrano. His monumental nose must have proven handy when sniffing his hometown’s finest wines. For these reasons and many more, Bergerac deserves consideration on its own merits. As the medieval wine region enters the twenty first century, its vintners are creating a feast of products ready for the world’s attention. I will continue to use Bordeaux as context for understanding these wines. But in truth, each of my favorite bottles listed below shares the story of Bergerac, not Bordeaux, and that’s why I like them. Much like its neighbor, Bergerac doesn’t adhere to a unified style in making dry white wines. Some producers like to use new oak barriques; others don’t let their wine touch an inch of wood. Some favor Sauvignon Blanc; others give Sémillon its day in the sun. One notable winery—Tour des Gendres—even bottles Muscadelle on its own. Whatever the case may be, Bergerac’s cornucopia of dry white wines on the whole exhibit a high quality-to-cost ratio. On the entry level, the whites are entirely inoffensive and quaffable, best suited as a warm-weather apéritif. They’re also tremendously inexpensive. But for only a few dollars more, Bergerac’s top-tier white wines demonstrate a disproportionately large leap in complexity. These wines illustrate a beautiful tension between tart, mouthwatering acidity and a waxen, palate coating texture—even when Sémillon isn’t present. The wines often show a pithy citrus character and tropical profile on the mid-palate —kiwi, star fruit, gooseberry—underlined by a distinctive grassiness and shimmering minerality. Montravel—a sub-region in Bergerac’s northwest corner—has long been celebrated for producing some of the most dignified white wines in the area, earning its own AOC designation in 1937. Perhaps Montravel whites display greater consistency across the board, but nevertheless examples of the highest caliber exist in both Montravel and the Bergerac AOC at large. Noteworthy producers of dry white wines in Montravel include Château Laulerie and Château du Bloy. As for Bergerac AOC, look for Château Bélingard, Château Tiregand, Tour des Gendres and Château de la Jaubertie. Many Bergerac wineries dabble in rosé production. The traditional style, typically made from Cabernet Sauvignon and Merlot, appears overly extracted and tastes regrettably flabby. The cause remains somewhat of an unknown. Maceration time for these rosés is often appropriately limited. But, even with two hours on the skins, and in some circumstances just direct press, the grapes manage to impart substantial pigment. The most successful examples depart from the local approach. They’re paler, higher in acidity and—ironic as it always seems—more concentrated in flavor. The two most distinguished examples I tried came from Château Pique Sègue and Château Bélingard. Laurent de Bosredon of Château Bélingard admitted this to be a new direction for their rosé, satisfying a global demand for lighter versions, à la Provence. Interestingly, on both ends of the pink spectrum, Cabernet Sauvignon’s green, pyrazine character makes itself apparent. In these best rosés the flavor is hardly disagreeable at all. Instead it offers a crisp, savory edge. It’s refreshing in the same way its mother Sauvignon Blanc can be in her most savagely herbaceous state. What struck me most about Bergerac’s red wines was how polarizing I found my reactions. On the low end, the wines were fruity and unpretentious, but ultimately unmemorable. While the reds I loved, I really loved, but each for wholly different reasons. Hardly any wines lay in any sort of middle ground. Yet, of course, high-end Bergerac red doesn’t come with the hefty pricetag of more name brand regions. The relatively negligible gap in cost between the worst and the best far underrepresents the actual gap in quality. Begerac red wines come in four forms. The basic Bergerac AOC again encompasses the whole region. Côtes de Begerac exists within the same boundaries, but must comply with stricter viticulture and vinification regulations. Pécharmant sits at the heart of the region, on the northern banks of the Dordogne River. Its vineyards date back to the eleventh century and have appropriately long held AOC status. Montravel Rouge is a newer phenomenon – at least in terms of its AOC classification. Here, Merlot must constitute fifty percent of the cuvée – not surprising given Montravel’s proximity to St. Émilion. I think much of the problem with a lot of Bergerac red stems from a question of aesthetics. Many of these wines are chief candidates for the oft-dreaded label “rustic.” The term is commonly used as a pejorative, loosely conveying the opposite of “refined.” I, on the other hand, am a firm believer in “good rustic.” For me, certain grapes, like Syrah and Sangiovese, actually benefit from a bit of bite. Without this, Côte Rôtie and Brunello di Montalcino would come off as more pretty than primal. It’s like when you don’t shave for a few days, but you have just the right amount of scruff that many find you even more handsome. For Cabernet Sauvignon and its posse, it’s a different story. You need to buy the straight razor shave. At their greatest, Bordeaux and Napa are clean and elegant, with clarity of flavor and a well-defined trajectory. Any murkiness or rusticity would be off-putting. As you read about my four favorite Bergerac reds below, you’ll find little commonality in style. One thing these wines all share is polish. If ever there were a product for which Bergerac should invite with open arms comparison to its Bordelais neighbors, it would be for its sweet wines. The great estates of Monbazillac and Saussignac truly give Sauternes a run for its money, and without charging nearly as much. With this category, Bergerac offers the world a treasure trove of liquid gold—wines of remarkable complexity and extraordinary ageing potential. The myriad appellations of sweet Bergerac wine fall in one of two categories: moelleux and liquoreux. Moelleux refers to wines that are sweeter than off-dry, but not meant for dessert. Interestingly, the French word translates to both “mellow” and “moist.” This is an apt description, given that moelleux wines offer a lifted, fog-like mouthfeel, never syrupy or viscous like their after-dinner counterparts. You’ll find wines labeled “moelleux” across France, from Sauternes to Vouvray. Bergerac’s specific appellations in this style include Côtes de Bergerac, Côtes de Montravel and the small AOC Rosette, the western neighbor to Pécharmant. At the table, these wines can fill a similar niche as Riesling Kabinett. They pair excellently with Asian cuisine, in particular spicy dishes that can be tamed by the wine’s sweetness. The liquoreux wines provide the most serious fodder for collectors. As the name suggests, these wines are unctuous and dense, and higher in alcohol as well. The wines of Monbazillac and the less prolific Saussignac to the east all undergo the effects of noble rot. The Haut Montravel appellation also produces wines in the same style. The wines are composed of Sémillon, Sauvignon Blanc and Muscadelle. The latter often comes in higher proportions in Monbazillac that it does in Sauternes, faring particularly well on the region’s sandy hills. As sugary as the wines may be, the flavors are not all sweet. The Muscadelle contributes a lovely white blossom aroma. As the bottles age and their colors darken from gold to amber, the wines will characteristically take on a nutty, marzipan quality. For moelleux, consider the wines of Château de Peyrel and Château Pique-Sègue. Liquoreux producers worth seeking out include Château Tirecul la Gravière, Château Bélingard, Château Puy Servain and the local cooperative, Château de Monbazillac. Dedicated to the famous children’s novelist, Laulerie’s “Comtesse de Ségur” is the estate’s top-tier white. One-hundred percent Sauvignon Blanc, the oak-aged wine shows richness without being stodgy. In fact, its flavors are quite agile. Pithy lemon and lime zest electrify the palate, balanced by shades of Thai basil, lemongrass and straw. Château Tour des Gendres counts among the few Bergerac estates whose entire portfolio bears no fluctuation in quality. Each bottle consistently represents the highest abilities of the region. Staunch advocates of organic viticulture, Château Tour des Gendres’ wines at once taste remarkably modern, yet hyper-expressive of their terroir. Their 2012 “Moulin des Dames” Blanc is no exception. This Sauvignon’s aromas evoke all the things we love about summer – jasmine, apricots, freshly sliced peaches. But the palate is anything but delicate. The wine has a distinct waxen quality and it charges at you with a pillar of citrus flavor, like a fistful of Meyer lemon peels coated in hard candle wax. It’s almost the anti-Sancerre, but this wine is evidence that this style of Sauvignon Blanc can also work magnificently. From the hands of globetrotting winemaker extraordinaire Hugh Ryman, Château de la Jaubertie’s “Cuvée Mirabelle” definitely shows international appeal. Mainly Sauvignon Blanc, with a twenty percent dose of Sémillon, this wine could easily fool you for one of California’s top offerings. This is not to undermine the wine’s outstanding quality. Palate coating and languorous, “Mirabelle” oozes juicy tropical flavors – lush pineapple, mango, grapefruit and pear. A vibrant needle of minerals and acidity pierces through the dense, fruity core, lending to a clean, but lengthy finish. By and large my favorite bottling in the category, Pique-Sègue offers a rosé that does everything rosé should do. Crisp, nuanced and undeniably quaffable, this wine comes on the more restrained side of the rosé continuum, where herbs are favored over opulence. The wine is silvered with Cabernet’s peppery greenness that only amplifies its refreshing crunch. Another stunning offering from Tour des Gendres, “La Gloire de Mon Père” is a blend of predominately Cabernet Sauvignon with a healthy portion of Merlot, as well as Malbec. The wine sits at that happy middle between power and finesse. The tannins are so fine, the wine feels more like satin than velvet. It also doesn’t shy away from the more savory character of these grapes – it’s elegance augmented by flavors of anise, gingerbread, violet and graphite. 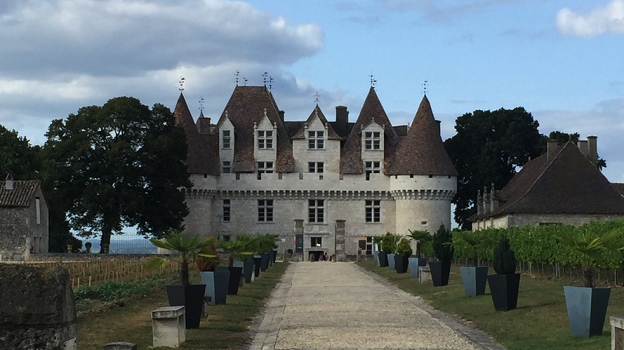 Château du Bloy’s flagship offers a worthy explanation as to why Bergerac at large is so excited about the red wines coming out of Montravel. The wine is essentially an even split between Merlot and Cabernet Franc. The property’s affinity for these grapes is not surprising, considering it is basically adjacent to Saint-Émilion. Le Bloy demonstrates supreme elegance – soft spice blanketing tight coils of black fruit. If one red were to provide evidence that Bergerac has all the means to create wines of elegance and complexity, Château de Tiregand’s Pécharmant “Grand Millésime” would very well win over any skeptics. Driven by mostly Merlot followed by Cabernet Sauvignon, the “Grand Millésime” stands at the crossroads of delicate spice and floral aromatics along with intense concentration of black fruit and earth flavor. The wine serves as testament to the power of restraint. It offers a very slow amplification, never quite reaching fortissimo, before marching steadily to its long, long finish. As the wine ages, its tannins transform from a down pillow to silk sheets of the highest thread count. The 2001, now in the middle of its life, has started to reveal more of its fresh, savory minerality, only adding to the wine’s intrigue. Château les Marnières’ Le Sillon Rouge voices the same spicy, floral high tones as Tiregand’s Grand Millésime, but nudges the opulence scale a notch higher. This is a juicy expression of Pécharmant, with a dense core of blueberry, black licorice, cassis and asphalt. Full-bodied, yet graceful, Le Sillon Rouge shows tremendous immediate appeal, as well as strong cellaring abilities. Château de Peyrel shows with their Rosette just how exciting the moelleux category can be. It’s sweet, but not too sweet, and lifted by a web of acidity that keeps the wine crisp, lithe and inviting to food. Floral aromas of orange blossom and jasmine intensify wine’s freshness. Primarily Sémillon, this Rosette has a lovely ripe cantaloupe and honeydew quality. Perhaps the gold standard for Monbazillac, Château Tirecul la Gravière’s 2005 is outstanding. Syrupy, but with acidic drive, the wine coats the palate and seems to shimmer, proving it’s more lively than languid. With flavors of dried white peach, candied pineapple, apricot, beeswax and maple, this Monbazillac is the perfect companion to the region’s foie gras as well as pungent blue cheeses. Blanche de Bosredon is a berry selection of Château Bélingard’s finest botrytized grapes, fermented in new French oak barrels. A tad more viscous and a shade darker in flavor than Bélingard’s Monbazillac Réserve, the Blanche de Bosredon tastes of dried apricot, quince, apple pie, toasted marshmallow and almond paste. Predominantly Sémillon, the wine’s nuttier side is only starting to reveal itself. It has a promising life in the cellar ahead. Nothing about Puy Servain’s Suprême is typical of Bergerac’s liquoreux wines. But it’s nevertheless sensationally satisfying. Sappy and unctuous, the wine seduces you with its texture just as much as it does with its taste. Despite the high sugar levels, the wine doesn’t taste strictly confectionary. It’s laced with more earthy characters of beeswax, honey, roasted cashews and fresh mushrooms.